Update June 2015: Creating a nutrition facts label has still become easier with the labeling tool in Shop’NCook Online. Update March 2016: Check also the new Canadian bilingual nutrition facts labelling tool! Important note: If you need to make a compliant label for a food product, make sure to consult the regulations. You need to correct the nutritional values computed by the software for loss during processing as well as take into account the natural product variations. See for example the Guide to Developing Accurate Nutrient Values published by Health Canada. I show you in this tutorial how to make a nutrition fact panel with the help of Shop’NCook Pro software. 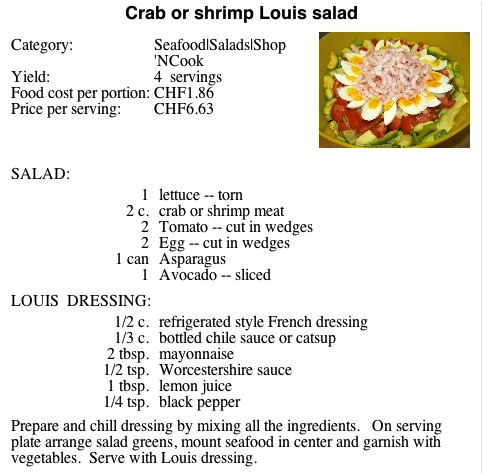 We take first a recipe for Crab Louis salad. 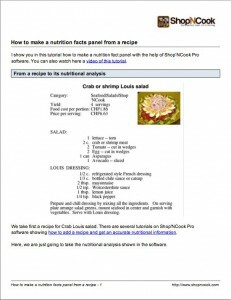 There are several tutorials on Shop’NCook Pro software showing how to add a recipe and get an accurate nutritional information. Here, we are just going to take the nutritional analysis shown in the software. The nutritional analysis in the software does not have many details by default. To display more nutrients, open the preferences and display the Nutrition tab. Here you have the list of the nutrients that you can display in the recipe. Select the nutrients you need and click on the arrow to add them to the list. 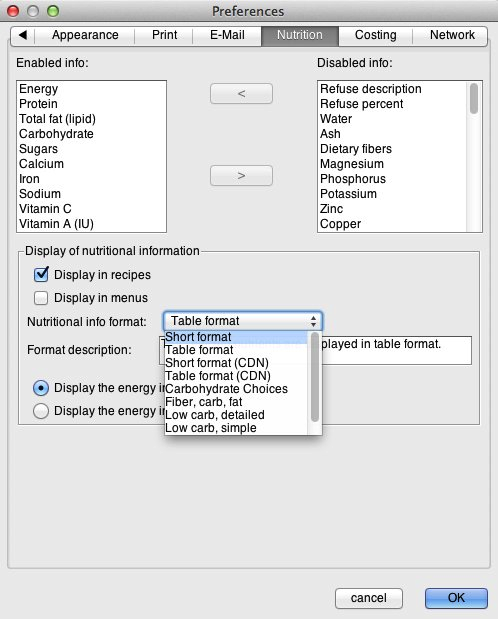 After selecting the desired nutrients in the preferences, select the format in which you want to display the nutritional analysis. I recommend you to select “Table format”. This will make it easier to make the nutrition facts label. Click “OK” to save the preferences. If you display again the recipe and scroll down, you can see that the nutritional analysis is in table format and has more information than before. Now, go to the free nutritional labeling tool on Shop’NCook website, which is a free online tool to create nutrition facts panels. Move the browser window on one side, and Shop’Nook Pro software with the nutritional analysis on the other in order to have both side-by-side to make it easier to input the values. 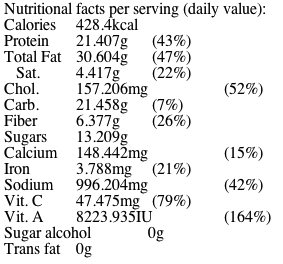 Input in the form the serving size and the main nutrient values calculated by the software, that is calories, total fat, saturated fat, trans fat, cholesterol, sodium, total carbohydrates, dietary fiber, sugars, and protein. Usually, you don’t need voluntary components. If you want to include some, select the checkbox “Include voluntary components”, check the voluntary components you want and type their values in. For vitamins and minerals, you can choose to input in the form the actual values or the amounts in percent. Shop’NCook Pro computes both. If you want to include optional vitamins or minerals, proceed like for the voluntary components: select the checkbox “Include optional vitamins or minerals”, check the vitamins and minerals you want and type their values in. If you want to create a nutrition facts label to label a product for sale, you need to include an ingredient list with the ingredients sorted by decreasing weight. When you display the Nutrition tab of the recipe in Shop’NCook Pro software, you will see the weight of each ingredient in grams. You can then easily order them by weight and type them in the form. For compound ingredients, like salad dressing, you can also specify their ingredients in parenthesis. To add it to the label, select the checkbox “Include an ingredient list” and type the ingredients in the field. 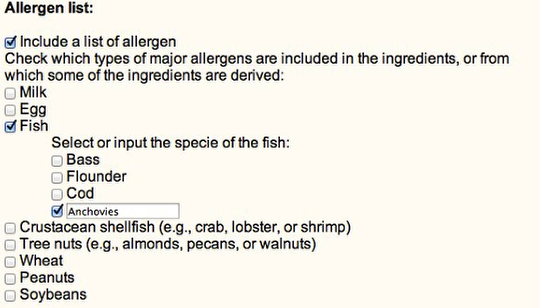 You can also include a list of allergens by selecting “Include a list of allergen” and checking the appropriate boxes in the form, that is milk, egg, fish, crustacean shellfish (crab, lobster, shrimp, etc), tree nuts (almons, pecans, walnut, etc), wheat, peanuts and soybeans. For the above ingredient list, the allergens are eggs, crab (crustacean shellfish), as well as anchovies (fish) that is included in the worcestershire sauce. Finally, you can optionally include the name and address of the manufacturer. Once you have input all the necessary information, click on “Create label” to generate the nutrition facts label. The label is formatted and the nutritional values are rounded according to the rules of the FDA. You can also generate the label in a shorter format if you don’t have much place on your product. Use the browser back button to come back to the previous screen. Scroll up, select “short format” at the top of the form and create again the label in a shorter format. 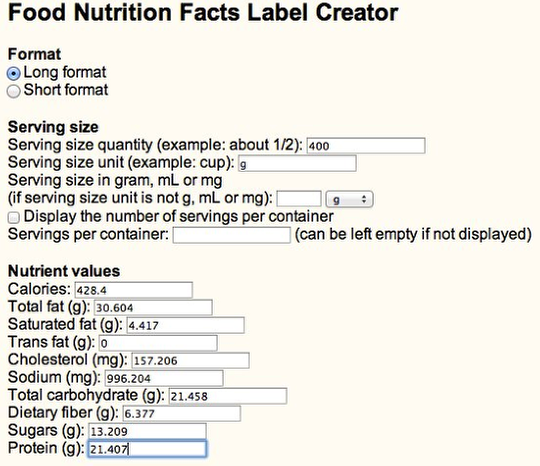 If you want to know how to create a nutrition facts panel to label a commercial product, you can find here more information on how to create compliant labels and if using software to compute the nutritional analysis is appropriate for your product. Now go ahead and create a nutrition facts panel! If you don’t have Shop’NCook Pro software, you can also download it here for a free 45-day trial and start labeling your products at once. I wish that this was part of the software instead of having to re-enter all of the information onto your website. I am working on it. I will let you know when it is ready for beta testing. The Canadian bilingual nutrition facts labelling tool is finally ready!